HEK 293 cells were transfected with a construct expressing FLAG tagged p27 kip1. The transfected cells were serum starved and then incubated without (-) or with (+) PMA, serum or PD 184352. The cells were lysed, subjected to SDS/PAGE and transferred to nitrocellulose membranes. 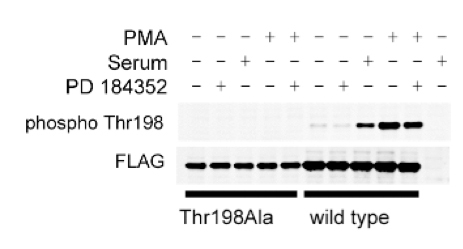 The membranes were immunoblotted with an antibody that recognises p27 kip1 phosphorylated at Thr 198 and with an antibody that recognises the FLAG epitope (anti-FLAG, Sigma). Binding of the p27 kip1 phospho Thr 198 antibody was detected using rabbit peroxidase conjugated anti-sheep IgG antibody (1 in 10, 000 dilution, Pierce) followed by enhanced chemiluminescence (ECL, Amersham). C-terminal phosphorylation controls the stability and function of p27kip1.